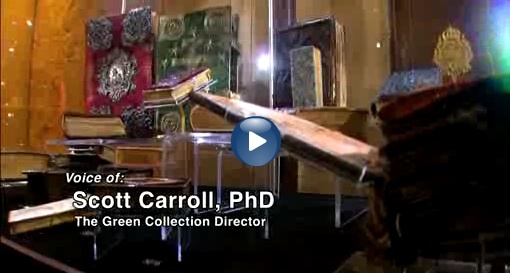 Update 3/9/2012: The Green collection is now at the Vatican; see this account at the National Catholic Register . Note: The Passages speaker series DVDs can be purchased from mardel.com individually or as a set . Manuscripts and artifacts of the Green Collection are already being sent to dozens of collaborating universities for research and publication. End of updates; regular post below. 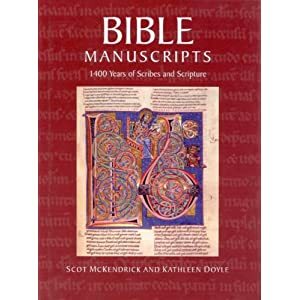 In celebration of 2011 as the 400th anniversary of the King James Version of the Bible, many institutions are hosting Bible exhibits this year – as I plan to do in the History of Science Collections in November and December. But from May 16 through October 16 at the Oklahoma City Museum of Art, the Passages exhibition is displaying select items from the remarkable Steve Green Collection. In this post, I’ll (1) note some highlights of the Green Collection, (2) offer a few tips for viewing the Passages Exhibition, and (3) applaud the scholarship represented in the free Speakers Series. and more – cf. Green Collection Fact sheet . Photo courtesy of The Green Collection. The Codex Climaci Rescriptus is an appropriate exemplar of the significance of the Green collection. Using a new technology developed by The Green Collection in collaboration with Oxford University, scholars have uncovered the earliest surviving New Testament written in Palestinian Aramaic – the language used in Jesus’ household – found on recycled parchment, under a later Syriac text, in this rare manuscript (video ). 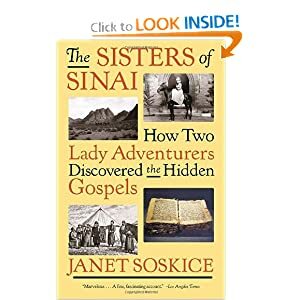 The story of the 19th-century discovery of manuscripts at Saint Catherine’s monastery in the Sinai peninsula by two Scottish twins is told in a lively account which mentions this manuscript by Janet Soskice, Sisters at Sinai (NYT review ; YouTube interview ). The Green Collection is already supporting research in a large number of collaborating universities, and through the Green Scholars Initiative is even being opened for undergraduate research to serve the next generation of scholars of ancient texts. This vision for a research collection is tremendously exciting! Watch these brief videos about the Green Collection. Find out more about the Green Collection , more about the Passages exhibit , and read an interview with Scott Carroll , Director of the Green Collection (cf. more about Carroll’s previous work ). 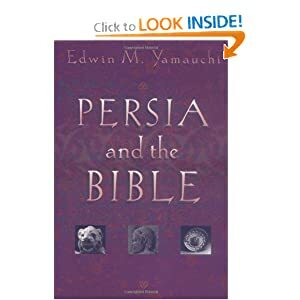 I urge anyone interested in the history of the Bible and its role in western and world culture, or in the history of writing and the Printing Revolution, to see the selection of items from the Green Collection now on display in the Passages exhibit . One of the most moving sections of the exhibit, for me, are the cases of Hebrew scrolls in the first room. These scrolls, of the Torah and of Esther , were meticulously created and maintained from generation to generation. They are frequently accompanied by beautiful and exquisitely crafted cases. Several scrolls on display came through the Spanish Inquisition and others survived the Nazi holocaust. Standing before these amazing Hebrew scrolls, I felt an overpowering sense of the presence of a cloud of witnesses preserving the Word of God through the generations in the face of all the world’s darkness. Multiply that times 10 – the “Synagogue” is but one of 11 rooms in the exhibit – and you have the impact of seeing Passages. Half a day: Quickly browse the exhibit, read most of the labels, do some of the interactive activities (e.g, print a page of the Gutenberg Bible on a replica of his printing press), watch the animated mannequins (from Jerome to John Knox), watch the videos that introduce each room (e.g., a conversation between Erasmus, Luther and Eck). In half a day you should have time for pre-teens to complete the scavenger hunt, after which they can receive a free prize in the exhibit gift shop. Labels contain 2 or 3 sentences that summarize the significance and character of items on display, so many visitors will find the labels to be a sufficient guide to the exhibit. Try a half-day option if you have kids, then let all those who are patient enough to examine the items in more detail come back to learn more. One day: At the entrance you will be offered an iPod touch with audio descriptions of each case and many individual items. To allow time to listen to the audio for many of the cases (but none of the individual items), schedule your visit for at least one full day. Take a generous break in the Museum cafeteria to discuss the exhibit over lunch. Multiple days: To listen to all of the audio descriptions for every item, get the multi-day pass. The total audio length is about 10 hours. In two full days, with breaks for lunch, I was not able to read every label and listen to every audio. I plan to return! The audio descriptions are informal recordings by Director Scott Carroll in which he points out features of the objects on display to examine more closely, and tells stories about the items, including their provenance and scholarly significance. 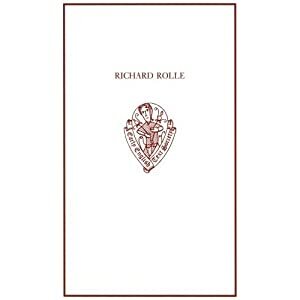 Think of these delightful recordings as “fireside chats” or “conversations with the curator.” Carroll’s excitement over each object shines through these extemporaneous recordings with contagious delight, and conveys the motivation that compels a curator to learn so many languages and invest a lifetime in academic study of rare, historic artifacts. These audios include riveting stories and historical background. For example, don’t miss the audio description of the Codex Climaci Rescriptus, mentioned above. 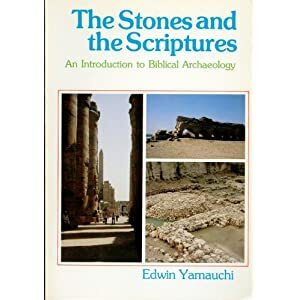 The Dead Sea Scrolls audio summarizes much of what you need to know to appreciate the Genesis fragment on display. 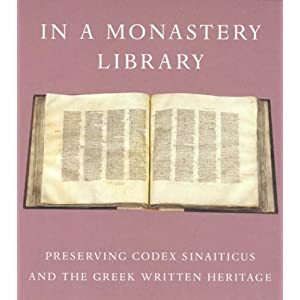 Audio #1303 ranges from the Coptic origins of monasticism to a moving story of the first known codex (book). 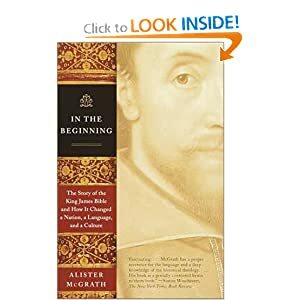 Audio #1601 describes how an English translation before Wycliffe, made for some Cistercian sisters, traveled through time to become incorporated word-for-word in some passages of the King James Bible in 1611. Audio #2602, describing Erasmus’ diglot of 1521, recounts the story of Luther’s reading of Romans 1 in Greek and how that text differed from the Latin Vulgate. The audios offer many more such stories about the items, their background, provenance and significance. I highly recommend listening to as many audio clips as you have time for. By the way, even those who listen to the audio recordings will want to read the labels, for some label information is not included in the recordings. What worked best for me was to read the labels for each case, then listen to the audio for the case overview, and finally listen to the audio for select items within a case. To do this at a patient pace, room-by-room, plan on 3 days. A printed guide to the exhibition is available in the Museum gift shop for $25. It features descriptions of 100 items, often similar to the content of the audio recordings, accompanied by large full-color photographs. It’s a bargain if you want a place to keep notes, a way to keep track of some of what you’re viewing in the exhibit, or a prompt for discussion and sharing of your exhibit experience over lunch in the cafe. I highly recommend getting a copy on your first visit (or reading it over lunch even on your first day); it will help you make more efficient use of your time during your next visits. Here’s map and parking info . Parking is $10/day on weekdays in a lot on the north side of the Museum (plastic accepted). Tickets are required; if you want to listen to the audios, get the multi-day discount. No ticket is required, however, to attend the free Passages Speaker Series, which begins this week at the Oklahoma City Museum of Art and runs on intermittent Tuesday nights for several months. The exciting line-up of speakers is listed below, with links to some of their books. I plan to make every lecture, but if you miss a lecture, DVDs of the talks will be made available, so monitor the website for details. Seating is very limited, so call ahead to reserve tickets. To choose a decent seat, plan to arrive no later than 6 p.m. Act soon: Tickets for every week can be reserved now, and will not last long. For more information about each of these speakers see the official schedule: Passages Speaker Series. 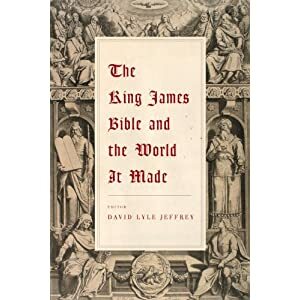 August 9, 2011, Gordon Campbell, “The Making of a Bible Classic: The Translation of the King James Bible.” Cf. his similar youtube video here and here . 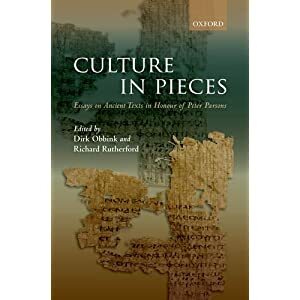 UPDATE: The Museum Gift Shop now carries DVDs of the speakers, which include privately-recorded conversations with each scholar, and the Passages Exhibition Catalog ($25). Reading the catalog beforehand can make it easier to absorb all the information in the audio narrations, and even provide an ideal place to take notes as you go through the exhibit. Wow, Kerry, what a fantastic list of speakers! Thanks for letting us know about this!